It gives us great pleasure to announce that Craig Young Consulting is now working with Nuffield Health corporate fitness solutions. Employees at the British Gas headquarters, Centrica, Windsor will be looking forward to their first week of training on the wall following a successful delivery and installation of their 4 panel system, with 9 handles on each panel. Nuffield Health takes care of your company's most important asset, your staff. Looking after their health and fitness gives your business a significant and productive investment. Nuffield Health can help your company every step of the way to set up the ideal corporate fitness facility. Whether you are looking for a fully integrated wellbeing centre or a small gym, Nuffield Health has the expertise and resources to create fitness services of the highest order. 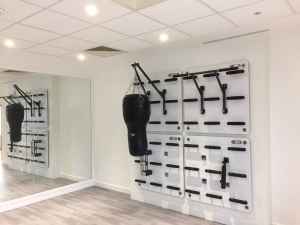 British Gas has opted for a versatile range of tools; 2 x TRX attachments, rope puller for battlerope training and vertical rope pulls, core plate trainer for Olympic bars, chin up bar and a punch bag attachment to accommodate an amazing 4ft leather Ricky Hatton angle/uppercut punch bag. Many thanks to Nuffield Health and Centric British Gas for taking such good care of us. We wish all the staff many happy years of working out in their fitness facility, and especially on the wall!